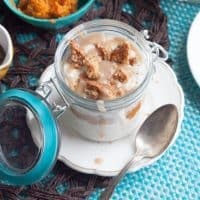 This quick and easy breakfast or snack recipe tastes like a festive holiday dessert without all the guilt. Instead, you’re filled with a ton of nutrients and health. Happy day-after-Halloween! Did you enjoy your holiday? Are you in a sugar coma? I’m pretty sure my son ended up with 3 batches of candy this year. One at school. One at his uncle’s work trick-or-treating. Then of course last night trick-or-treating for as long as his little legs would carry him. I think I’m going to have to sneak in his bag to do some special “mama inspections” of the candy… just sayin’. The thing about Halloween is that as soon as it’s over, the REAL holiday season kicks into high gear. I know the majority of the world seems to go right from Halloween to Christmas, and I promise you we’re not doing that here at Happy Food Healthy Life. We’ll be enjoying more pumpkin like in today’s recipe. And I already have quite a few Thanksgiving recipes lined up for you. Before we get into those details though, Let’s get back to pumpkin! I just wanted to share this quick little video with you. It shows just how easy these little parfaits are to put together. Really, just a couple minutes, and you’re set with a healthy breakfast or snack that will keep you full until your next meal. And it doesn’t hurt that it tastes a bit like pumpkin pie! See?! I told you it was easy! Make sure you subscribe to my youtube channel so you don’t miss out on any more recipes –> Here’s the link to do that. 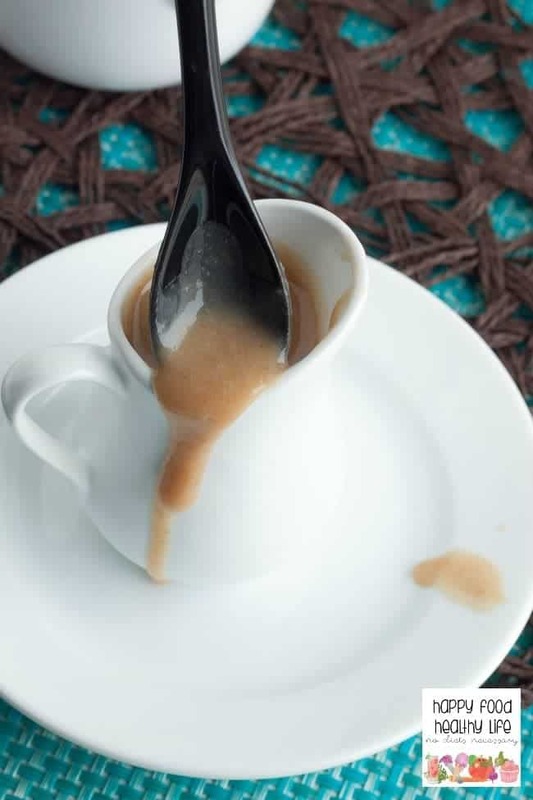 Also, to get that 2-Ingredient Vegan Caramel Recipe, here it is! After a weekend of indulging in mini-almond joy candy bars, reese’s minis (that totally taste better than the normal size reese’s), and caramel apples, I have to admit that I’m sick of it all. I’m ready for something healthy! That is why this little parfait is so perfect! The chia seeds that I mixed into the yogurt give this a boost of omega-3’s, antioxidents, and fiber. I have to say though that my favorite part is a tie between the fresh pumpkin puree and the super healthy caramel sauce. It totally makes the parfait seem decadent and dessert-like! Healthy? Pumpkin-y? All-over delicious! Takes just a couple minutes to whip together. Combine yogurts and chia seeds together in a small bowl until mixed well. Set aside for at least 30 minutes so the chia seeds can soften. Mix the pumpkin puree, cinnamon, and nutmeg together. 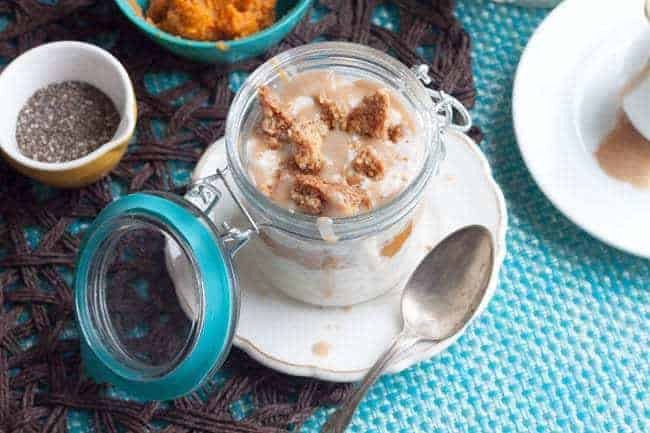 In 2 jars, layer yogurt & chia mixture, pumpkin puree, and crumbled granola bars. 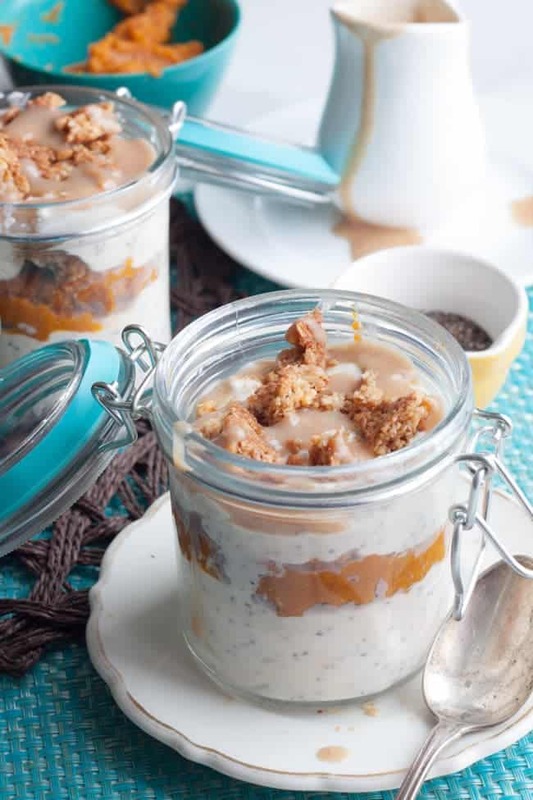 Create this layer twice and top with a drizzle of healthy caramel sauce. Enjoy right away or within 3 days, stored in the refrigerator. Now, like I promised you, I’m getting you all set up for the holiday shopping. I teamed up with my favorite bloggers, and we’re giving away $500 to one lucky reader. Just enter through the rafflecopter form – there are many ways to enter the giveaway, which means many chances to win that cash. Yummm, looks good, Holly! Thanks for sharing with us at the Merry Monday Link Party. Hope to see you again on Sunday! Exactly! I’m all about making smart choices so I can really indulge in the foods that mean something to me… like freshly-baked apple pie!